It&apos;s not uncommon to be presented with a business card when meeting someone for the first time. It&apos;s rare, though, to be presented with one that is 30 years old. But that is exactly how I was introduced to Stu Frederick at his place of business, a music store and recording studio in Exton, Pa. After a handshake, Frederick handed me his card, which identified him a Theater Manager for Devon&apos;s Valley Forge Music Fair, a position he held from the late 1970s to the mid-1980s. "I&apos;ve kept this card all those years," Frederick says. For him, they encapsulate the many memories of working in one of the area&apos;s most well-known and fondly remembered entertainment venues. The Valley Forge Music Fair opened in 1955, when it was covered by a canvas tent and the best seat in the house was a whopping $3.50. Four decades later, it closed after the last performance of Kenny Rogers and his 1996 Christmas show. The concept of major-league entertainment in the King of Prussia area has now been revived by the Valley Forge Casino Resort, which is retaining the Music Fair&apos;s original labelling. 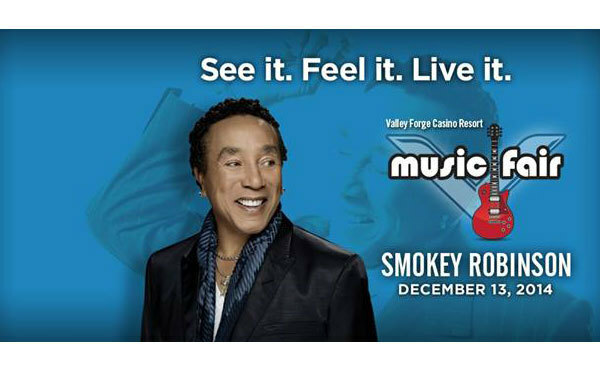 The grand re-opening is December 13, when Smokey Robinson takes the stage in an evening that sold out weeks ago. KC and the Sunshine Band has been confirmed for January 24, and comedian Dave Attell sends audiences rolling in the aisles on February 6. Tickets are available online. Frederick grew up in the area. "The first concert I ever saw at the Valley Forge Music Fair was the King Singers, accompanied by Alvino Rey and his Swinging Guitar. The performance was under the tent, and the seats were canvas hammock-chairs. They sat you bolt upright and weren&apos;t very comfortable, but they got the job done," he laughs. The Conestoga High School grad went into the Coast Guard and after his discharge, went to West Chester State College. Post-college, he sold motorcycles. He saw an ad in the paper that the Music Fair was hiring an Assistant Manager, and he got the job. "My first performance was managing the show with Bonnie Raitt in 1979," he remembers. It was the beginning of a four-year history with some of the most notable performers in the entertainment industry. Frederick recalls many of the giants with clarity, noting the personal touch they brought. The theater-in-the-round layout of the Valley Forge Music Fair stage made it unique. When the tent was replaced by a sturdier roof in 1971, care was taken to ensure good sight lines for the audience. Frederick notes that in the round, much more imagination was required of the audience than with a traditional proscenium stage. Large-cast musicals, for example, required heavy doses of creativity to bring set pieces to life. Hello, Dolly!, for example, requires an on-stage train leaving Yonkers station for New York. Managing that plot point in the round required resourcefulness and cleverness, owing to the lack of space to use an actual set-piece passenger locomotive. Frederick rolls through a virtual who&apos;s-who of stars who basked in the limelight of the round stage at the Music Fair: "I remember Diana Ross coming out of her dressing room for rehearsal in spiked boots and leotard," he notes. "When Richard Harris played in Camelot, he ate a canister of Irish oats before every performance. Ella Fitzgerald spent time backstage watching The Price Is Right. Bob Hope&apos;s meal of choice was lamb with mint sauce. Eddie Murphy walked the hallways wearing dark sunglasses. Comedian Don Rickles remembered the name of every staff person, even though he hadn&apos;t been at the Music Fair in a year." Some of Frederick&apos;s most vivid memories are of Frank Sinatra. "He played nine shows here," Fredericks comments. "The line for tickets for those shows ran around the building one and a half times. He was an amazing performer. He was so comfortable. He was just as happy in front of an orchestra as he was in his own living room. He really enjoyed himself." According to Frederick, Sinatra possessed an attuned musicianship. "There was a conductor for the orchestra for those concerts, Vincent Falcone, Jr." he says, "but really, Sinatra was the conductor. I remember him gesturing to quiet the instruments down - shh... shh... - as he sang." Frederick is excited about the revival of the Music Fair and looks forward to returning as an audience member. The setting may not be exactly the same, but the excitement of bringing star-powered entertainment to Valley Forge and Montgomery County should be very familiar. The Casino Resort looks forward to opening night with much anticipation. Chief Marketing Officer Jennifer Galle comments: "We are offering a signature Music Fair guest experience by bringing national headliners to our state-of-the-art venue. We look forward to offering these types of high-caliber performances within our upscale resort - including hotel, dining and a safe, exclusive gaming environment - for years to come." Montgomery County has an active theater scene for live entertainment. As you wait for the Music Fair arrival of KC and the Sunshine Band in January, consider the programming at Act II Playhouse, DCP Theater, People&apos;s Light and Theater and the Keswick Theater. Other performance venues are listed on our website.